President Bush stepped up his defense of a secret domestic surveillance program Monday, telling a year-end White House news conference he will continue it as long as the nation faces the "threat of an enemy that wants to kill American citizens." Brushing aside bipartisan criticism in Congress, Mr. Bush said the program has been effective in disrupting the enemy, while "safeguarding our civil liberties." He said it's done in a way that's consistent with the laws and the Constitution. He also said that as president and commander in chief he has "the constitutional responsibility and the constitutional authority to protect our country." In a session with reporters in the East Room of the White House, Mr. Bush also called it "inexcusable" that the Senate was blocking renewal of the USA Patriot Act, portions of which are set to expire at year's end. "In a war on terror we cannot afford to be without this law for a single moment," he said. The legislation has cleared the House but Senate Democrats have blocked final passage and its prospects are uncertain in the final days of the congressional session. Mr. Bush spoke a day after addressing the nation about the war in Iraq, urging patience and declaring that the United States was winning the battle. In his opening press conference remarks, Mr. Bush said the warrantless spying, conducted by the National Security Agency, was an essential element in the same war on terror. He called the leak of details about the program "shameful." The existence of the program was disclosed last week by The New York Times, triggering an outpouring of criticism in Congress, but an unflinching defense from Mr. Bush and senior officials of his administration. The president spoke not long after Attorney General Alberto Gonzales said Congress had given the president authority to spy on suspected terrorists in this country in legislation passed after the attacks of Sept. 11, 2001. Mr. Bush and other officials have said the program involved monitoring phone calls and e-mails of individuals in the United States believed to be plotting with terrorists overseas. Normally, no wiretapping is permitted in the United States without a court warrant. 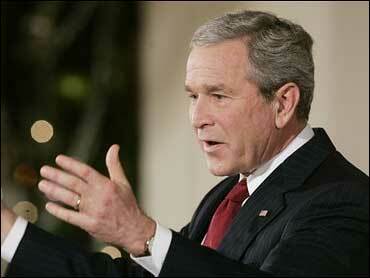 But Mr. Bush said he approved the action without such orders "because it enables us to move faster and quicker. We've got to be fast on our feet. "It is legal to do so. I swore to uphold the laws. Legal authority is derived from the Constitution," he added. Democrats were skeptical of the president's explanations. Sen. Russ Feingold of Wisconsin said, "I don't know why the president is concerned about the Patriot Act when he apparently believes that he can just do all this stuff by himself anyway." "He is the president, not a king," Feingold said. Despite the weighty issues Mr. Bush addressed, the president bantered with reporters at times. "So many questions, so little time," said CBS News chief White House correspondent John Roberts. The president had a ready retort: "Ask a short question," he said. Mr. Bush was asked during the news conference to name his top priorities for the coming year. He mentioned keeping the U.S. economy growing and helping recovery efforts along the hurricane-battered Gulf Coast. And he responded to criticism of his record on racial issues, exacerbated by the images of thousands of blacks stranded in New Orleans after Hurricane Katrina. "One of the most hurtful things I can hear is, you know, Bush doesn't care about African-Americans," he said. "First of all, it's not true. And secondly, I believe that obviously, I've got to do a better job of communicating, I guess, to certain folks." He urged Congress to reauthorize the Voting Rights Act and promised to sign it. Mr. Bush also said he looks forward to an up-or-down vote next month on Judge Samuel Alito's nomination to the Supreme Court. But the session was dominated by national security issues – specifically the newly disclosed spying program by the NSA. Mr. Bush emphasized that only international calls were monitored without court order those originating in the United States or those placed from overseas to individuals living in this country. He stressed that calls placed and received within the United States would be monitored as has long been the case, after an order is granted by a secret court under the provisions of the Foreign Intelligence Surveillance Act. One of the principal provisions of the Patriot Act permitted the government to gain warrants in cases involving investigations into suspected terrorists in the United States – an expansion of powers previously limited to intelligence cases. The news conference, which ran just shy of an hour, was the latest in a series of events – appearances outside Washington, meetings with members of Congress and an Oval Office address on Sunday night - in which the president has sought to quell criticism of the war in Iraq and reverse his months-long slide in the polls. It was Mr. Bush's first full-fledged news conference since October and his ninth of the year.